The building, like many in the area, is construced using the distinctive local Crab Orchard Stone. This stone is a rare sandstone from nearby Crab Orcahrd Mountain and is noted for it's color streaks and differing shades of brown. 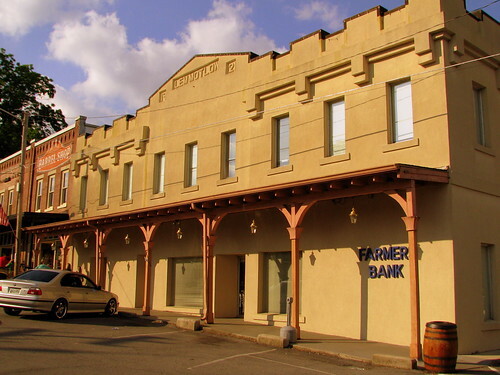 Located on the south side of the center of the town square in Lawrenceburg, TN. 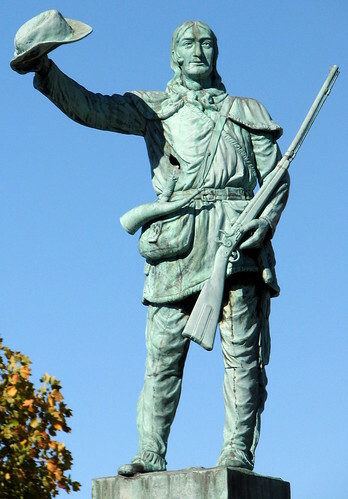 Erected by gift of the people and legislature of Tennessee, to the memory of Col. David Crockett. Born in East Tennessee Aug 17th, 1786. And gave his life for Texas Liberty amid the smoking walls of the "Alamo" Sunday Morning March 9th, 1836. Justice of the Peace for Lawrence County 1818. Member of the Commission of Lawrenceburg, 1819. Represented Lawrence and Hickman counties in the state legislature 1821-22. Congressman from west Tennessee, 1827-1831, 1833-1835. Erected 1922 by W.M. Dean Marble Co. Columbia, Tenn.
Path-finder, Pioneer, Hunter, Patriot, Statesman and Soldier. His fame is immortal with the story of his state, and the glory of his death. "Thermopylae had its messenger of defeat. The Alamo had none." There is a second section now added to the Historical Markers Extended Gallery, now for Franklin and surrounding Williamson County. Altamont, TN, built in 1885, and is on highway TN56. 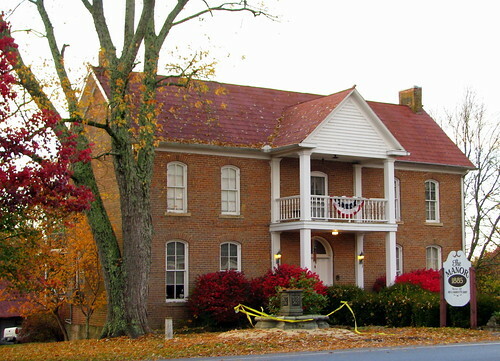 Listed on the National Register of Historic Places, and is now run as a Bed & Breakfast. 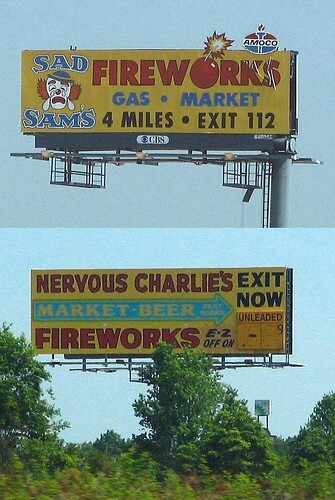 No drive north of Nashville on I-65 would be complete without seeing the billboards for the two major fireworks stores in the area. located on the Lynchburg town square. At the top is the date of 1921 and the name of Lem Motlow, who was Jak Daniel's nephew who ran the Distillery after Daniel's death. Motlow also opened the hardware store next door. 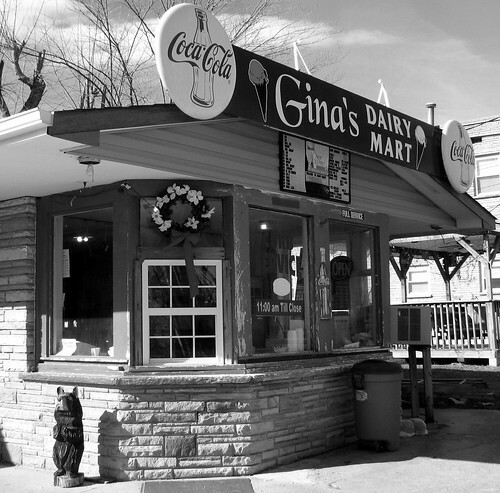 When travelling the World's Largest Garage Sale in early August, you might consider stopping at Gina's, home of the Homestyle Double Golly Whopper (a hamburger with everything and costs $7, apparently). Located on the Jamestown town square behind the Fentress County Courthouse. This Colonial Revival style two story brick structure was built in 1911. 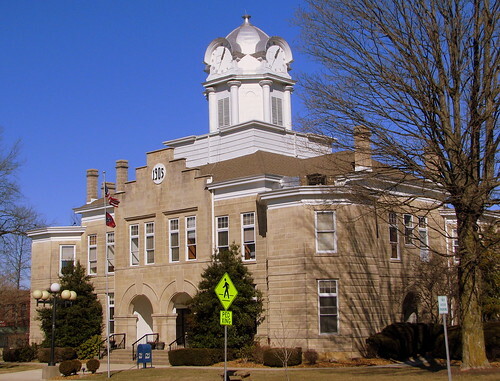 It has a design similar to the Bledsoe County Courthouse (before their expansion) just up the road in Pikeville, which was built a year prior. 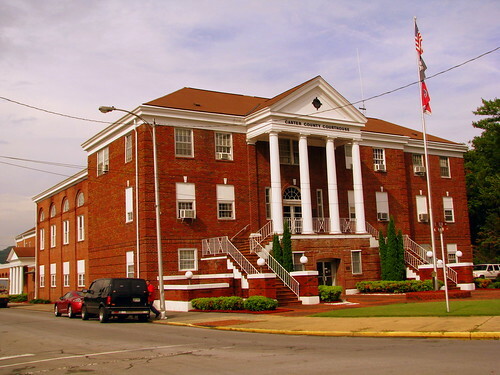 Most notable is the two story projecting portico with four white columns made of bricks. The structure is covered by a hipped roof and the principal elevation features six plain two story pilasters. The front double doors have a half circle window above it. Functionally, the door that gets used is on the left side. 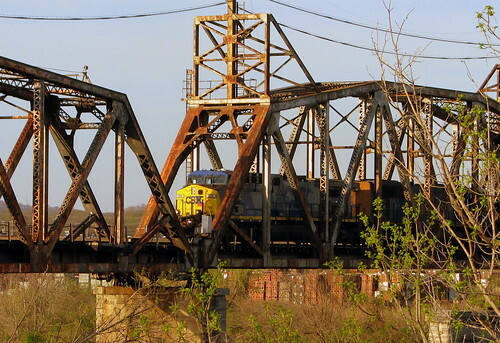 There is a nice old rusty rotating train bridge in downtown Nashville that now is part of CSX. As I was driving around the area recently, I heard the train whistle off in the distance and quickly wanted to get in position to get a shot like this. I took the first parking space I could find without cinsidering whether or not I should park there. It happened to be a parking space just for cops. Luckily, I got out before I got a ticket. I am in the process of setting up what I call Extended Galleries on the website, and the first new gallery is Historical Markers of Nashville. 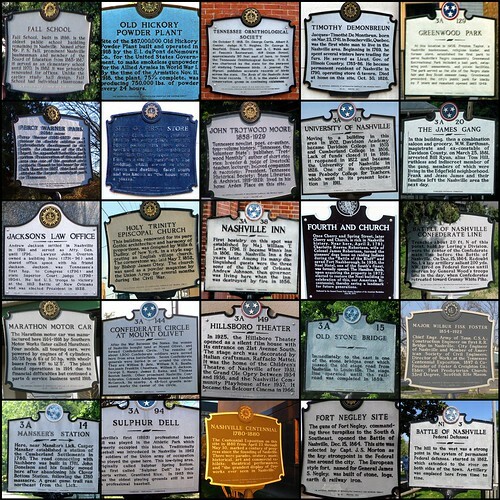 Over the coming weeks, I will add Historical Marker galleries for other places in Middle Tennessee. After that, I will have other themes, like highway signs, trains, post offices, etc. These galleries are going to contain topics that might not appeal to as many people, but I might someday put up something you've been waiting for. When a new galley arrives, I will announce it here. 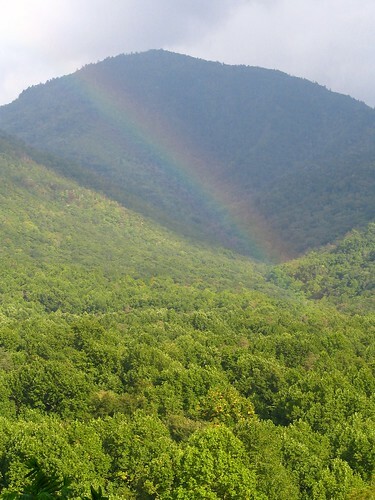 The day my wife and I drove Newfound Gap Road through the Smokies, it was very cloudy and rainy. For one brief moment, the clouds opened up and this rainbow emerged. Our car was the first of a dozen or so cars to pull off the street into a small parking lot and get a snapshot of this. 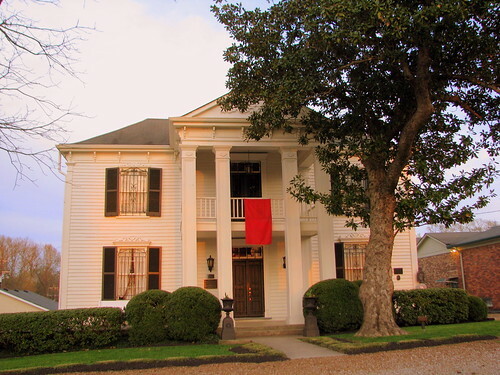 The Lotz House is across the street from the Carter House in Franklin, TN and was an important location in the Battle of Franklin during the Civil War. Today the house is opened as a Civil War museum. German immigrant Johann Lotz was a carpenter who finished his house in 1958 and also used it as a "show house" to potential clients. The inside of the house has an engineering impressive black walnut wraparound handrail that starts on the ground floor and wraps all the way to the second floor, as well as outdoor handcarved acorn finials, millwork and cartouches that were constructed by Lotz. 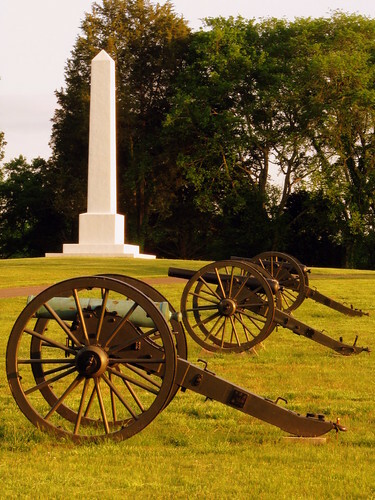 On Nov. 30, 1864, the epicenter of the battle of Franklin was right at the Carter and Lotz propery. The Lotz family feared they would not survive inside their wooden home and accepted an invitation to hide in the brick basement with the Carter's in their basement for 17 hours while the battle raged. Historians note that the hand-to-hand fighting that happened right in this yard was some of the most severe during the civil war. When the dust had settled, the house was used as a hospital and there are numerous blood stains still visible in every room of the house. Today, you can visit the house, which is located on Columbia Pike (US 31) just south of Five Points in Downtown Franklin. The house was added to the National Register of Historic Places. ...is now open for business. Every July in every highway leading out of Nashville, there is a large gravel lot that is not used 11 months of the year. 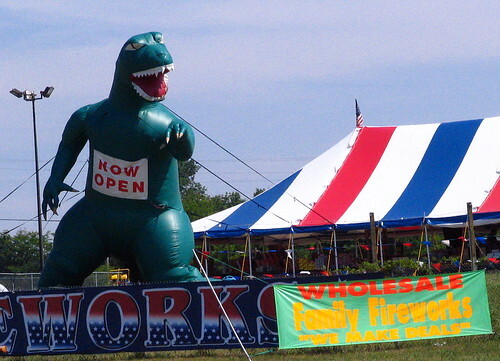 It is the prime real estate for Fireworks tents. This one is I-24 in LaVergne at the exit for Waldron Rd. Everybody's fireworks are 70% off, so that doesn't make anybody's sales price better than anyone else. If a fireworks stand had a big sign that said 10% off, nobody would stop there. The only other industry that works this way is Jewelry. The RC Cola and Moon Pie Festival in Bell Buckle is Today! If you were on the fence about whether or not to go, maybe this will convince you. For me, the highlight of the festival is a play starring the locals. It was low budget put on by volunteers, but I liked it as they put in a lot of effort and it had a lot of small town charm that I like. The story was essentially the pairing of Mr. RC Cola and Miss Moon Pie loosely set to Shakespeare's A Midsummer Nights Dream. For no apparent reason, most characters acted their parts while standing in a wading pool. 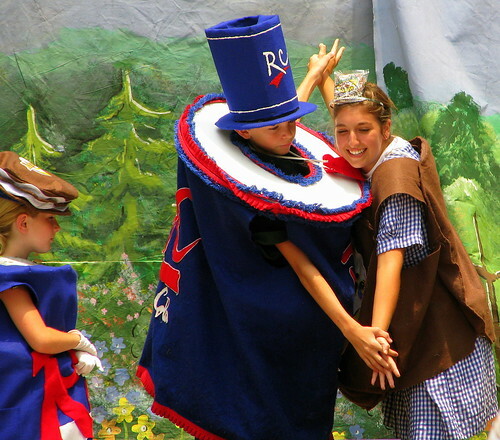 One of the Quintessential small town southern festivals is tomorrow in the quaint town of Bell Buckle, the yearly RC Cola and Moon Pie Festival. 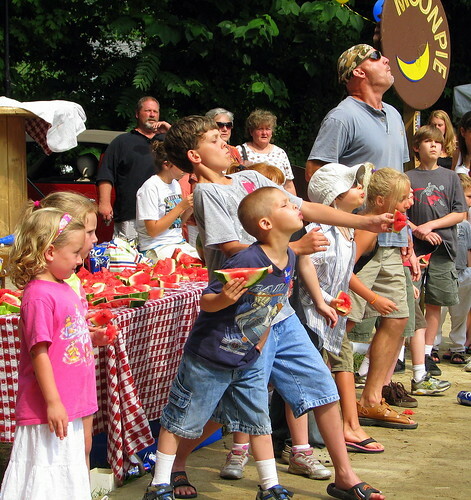 There are all kinds of contests for the young and the old, like the watermelon seed spitting contest. I suppose this contest makes for not too interesting photos. This is the best I had. It's one of those contests where a bunch of kids and a few adults enter, and the big tall guys win, just like the moon pie toss. 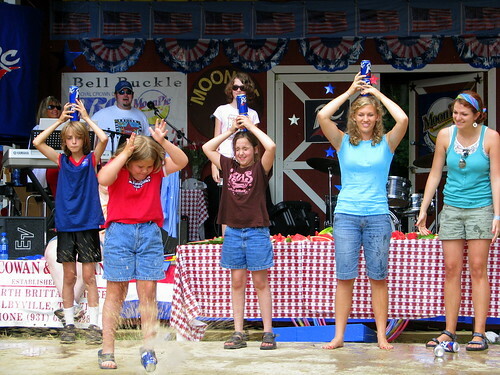 At the 2008 RC Cola and Moon Pie festival in Bell Buckle, TN, just as they have done in years past, some "Olympic" games were played. This contest was the RC Cola Dash. The "Dash" part is a little misleading as this was not a speed contest, but more focused on skill and accuracy. The Rules: Take an open but full RC Cola can and balance it on your head. If you can make it all the way to the finish line (about 20 feet away) without dropping it (or steadying it with your hand - which would be cheating) you go on to round two. In round two, you stack two RC cans on your head. 4 contestants made it past round two onto round 3 stacking 3 RC cans on their head! The girl in the red shirt was sadly not one of them. Time for a game of Checkers. Have a seat, look around and hep us honor Mr. Herb Fanning. Herb understood that the character of our whiskey is drawn from the character of this place, its people and their past. We hope you'll see it that way too. Shown here is one of those sculptures. 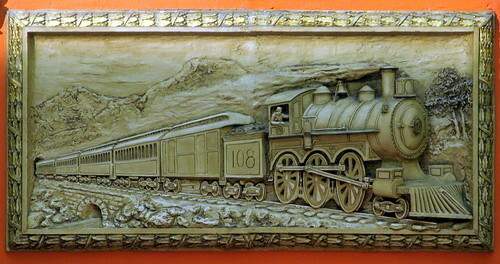 This one depicts a steam locomotive, engine #108. The last trian pulled up at Union Station in the 70's. In the late 80's the station was opened as a hotel, and in 2007 the entire lobby underwent an extensive renovation. 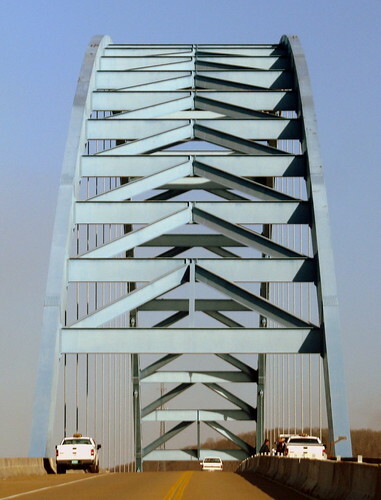 The big blue bridge is a metal through arch bridge and is 1,514 ft. long. There was some minor road construction going on this day. 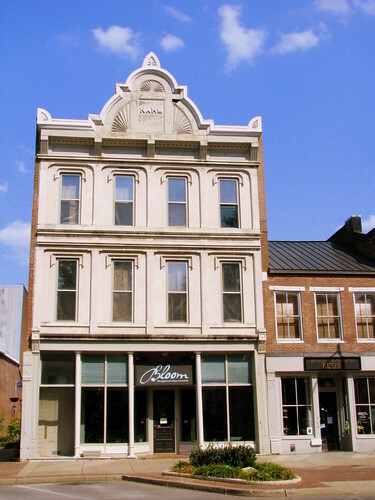 This Italianate building was built in 1888 as a new location for Emanuel Nahm's dry goods store. He claimed his store was the "largest clothing and gent's furnishings store in Southern Kentucky." The Third floor windows have rounded hoodmolds and the second floor has flat hoodmolds, all placed in recessed panels. At the top of the building accentuating the Nahm name is a sunburst motif. The facade is faced with Bowling Green limestone and the building went through restoration in 1980. Built in 1917, this is the NCStL depot in the important railroad town of Bridgeport soon before trains cross the Tennessee River. The Sequatchie Valley Railroad also came through here. Today it is CSX along the tracks with some Norfolk Southern and Union Pacific coming through. The architecture here is an unusual design for this part of the country, a Spanish Mission style that you would more likely see in St. Augustine or San Antonio. 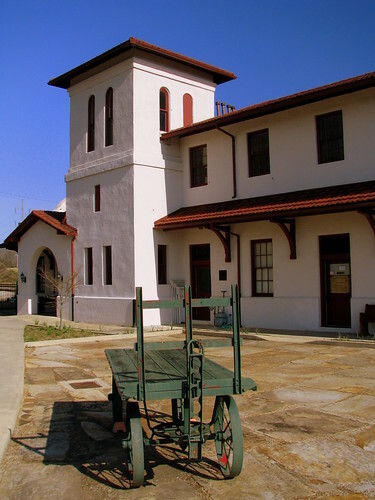 Today, the depot is a museum operated by the Bridgepoort Area Historic Association (BAHA). 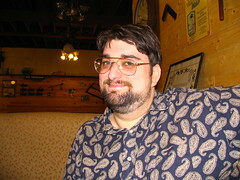 On rutledge hill. 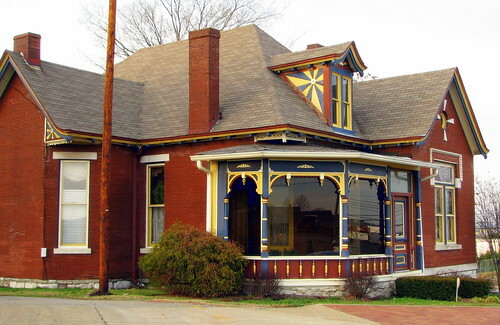 This home was built in the 1880's and at one time was a beauty salon. 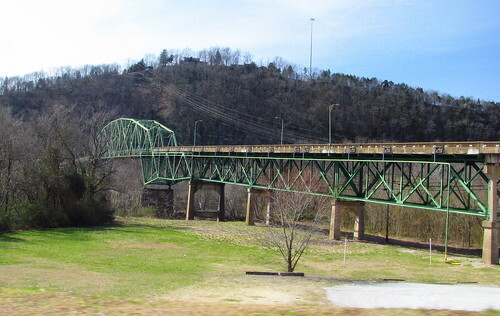 It is the old bridge connecting Carthage to South Carthage over the Cumberland River. On the south side of the river, is just a bluff and an area wide enough for U.S. 70S to pass through. It was built in 1936 and was the second bridge to span the river at this spot. Cordell Hull was Secretary of State for FDR for 11 years. I would have driven over the bridge, like I did last in September 2007 but the bridge was closed in 2008. Hopefully, it's just for repairs and is not permanent. At the Tennessee State Fair, Tropical Illusions is an animal themed magic show for the family. Befroe the show starts, this bird does a trick. 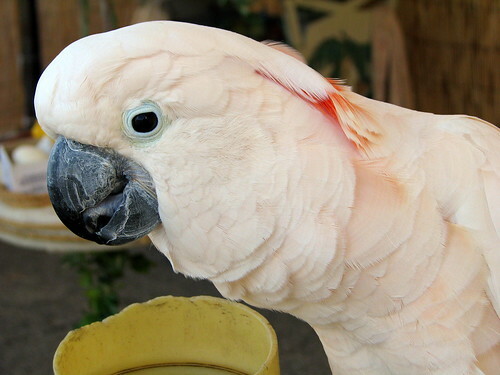 The cockatoo is perched on a stick. the host had an empty water bottle tied to the end of a rope hanging from the stick, and dropped a fruit loop into the water bottle. The bird uses his feet to slide the rope through his feet so that he could reach the water bottle with his beak. He leans backwards to let the fruit loop fall into his mouth. He then dunks the fruit loop into the water dish so that he could eat it. 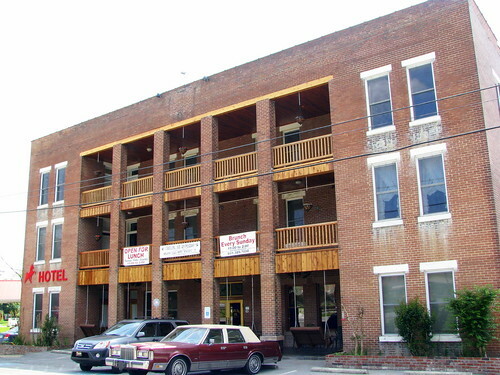 This hotel was built in 1917 in Wartrace, TN as a railroad Hotel, as it sits near the center of town where the depot used to be. 21 years later, the original owners, Jesse and Nora Overall sold the property to Floyd and Olive Carothers. Floyd had a reputation as a first class horse trainer, and the next year bought a young horse by the name of Strolling Jim. Soon afterward, that horse won a new festival celebrating the new breed of Tennessee Walking Horses. That festival has since turned into a world class event held every year in nearby Shelbyville and Wartrace is now known as the birthplace of the Tennessee Walking Horse. Strolling Jim strolled for many years in the pasture behind the hotel, and is now buried back there. I first learned of this hotel in the mid 80's when I was about 10 and my family made the 90 minute drive from Nashville for Thanksgiving lunch. For my return visit 20 years later, the place is absolutely nothing like the way I remembered it. More recently, the hotel was purchased by a local musician, Joe Peters, in honor of his wife who died of cancer, but she fell in love with the building soon before she died. The Music Hall inside is now named after her. 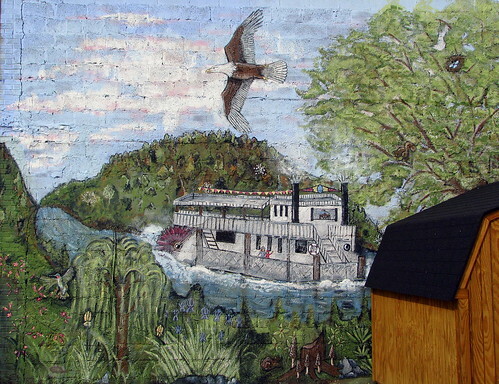 Now, people go to Celina to go to Dale Hollow Lake, but the town began as an important river town along the Cumberland River, as this mural shows a riverboat. A Bald Eagle and its nest is included for the fun of it. This is located at the town square, in the small parking lot of a restaurant, which is why there's a small shed blocking the view. 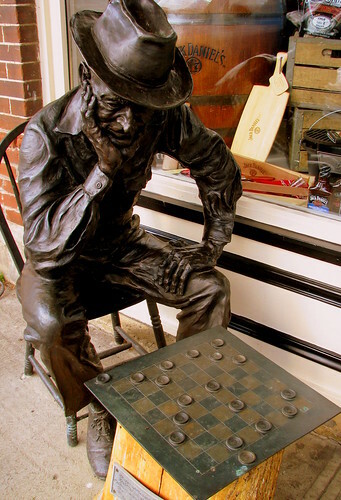 More and more cities are coming up with a town mascot, which is then being made into artistic statues. It used to only be big cities that did this, like Nashville and the catfishes. Now some of the smaller towns are doing it, also, such as Pulaski, TN and their Turkeys, since they have large flocks of wild turkeys walking around the countryside. Pulaski has a celebration one weekend each April called the Gobbler Gala with activities like frozen turkey bowling and a kids turkey calling contest. 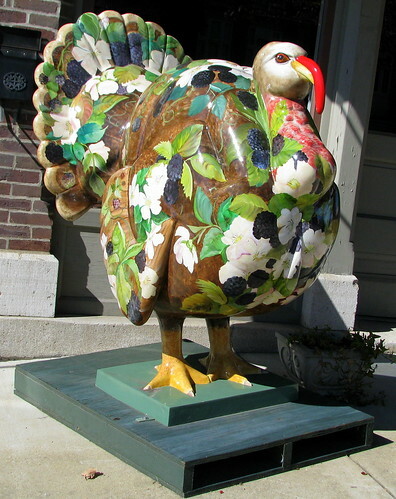 This Turkey is Blackberry Gobbler and is located on the west side of the town square. If you've driven along I-40 through western middle Tennessee, then you've seen the signs for Loretta Lynn's mansion, museum, dude rance, cafe, campground, gift shop and flea market. 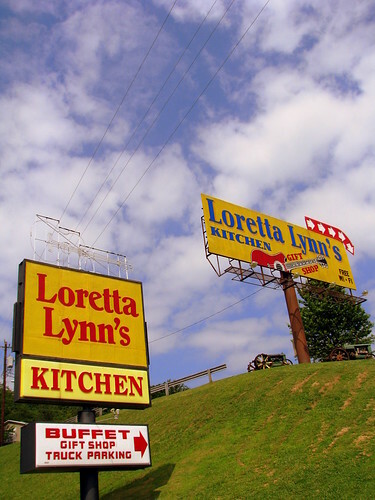 If you're time is limited and can't make the 8 mile drive to Hurricane Mills, then you can catch 1/10th of the experience at the Loretta Lynn Kitchen, which is right off the Interstate and up the hill. You can't miss it. I bought a post card of her husband riding a jeep. 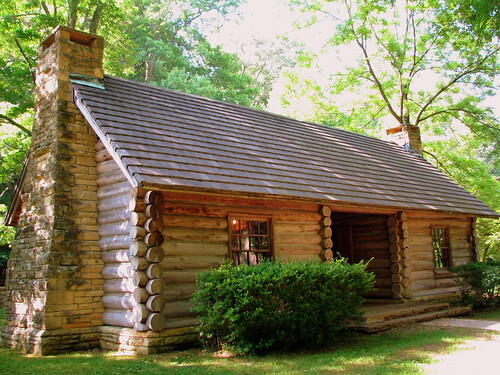 In 1956, a replica of the McAdow cabin was built. In 1960, to celebrate the sesquicentennial the Birthplace Shrine Chapel was built. 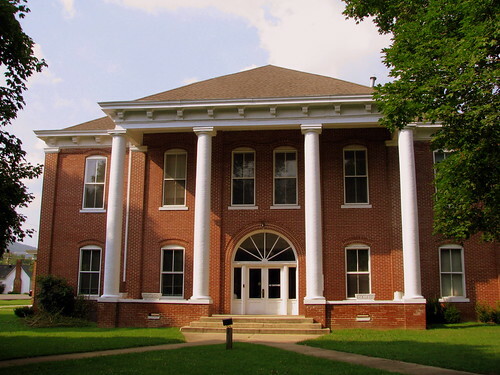 In 1852, Carter County had the need to build a new courthouse. Built at a cost of $7,100 was this three story building. At the time it was first built, there was a recessed portico with pedimented gable. The roof had stepped end gables with domed octagonal cupola in the center. In 1901,a major wind storm in March followed by a great flood in May did damage to the courthouse and destroyed many nearby buildings. Plus, a couple of additions have been added to the back. In 1933, a fire caused damage to the building and it was rebuilt with a number of design changes. A projecting portico was added with a one story base was added along with the stairways along either side. The gabled roof was changed to a hip roof and the cupola was removed. 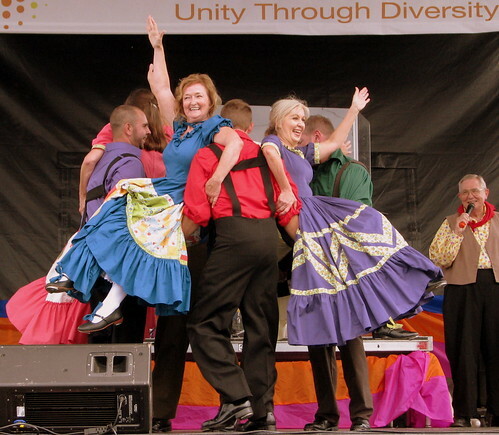 During the Festival of Nations event during the 2009 Tennessee State Fair, many cultures around the world, including America, were celebrated. Representing Appalachia were the Cripple Creek Cloggers from Murfreesboro. During this part of the dance number, the men picked up the women under the shoulder and they all spun around in a circle.